There are several roles in the process of presenting the social interactions between people and objects during the ethnography stages. This final blog post for the July series is not intended to portray the observational methods in the anthropology and fine art discipline roles. These discipline roles will be addressed in my methodologies essay. My focus is on the roles within the ethnography process and the transition of the roles and methods during my collecting process for the collections project. The beginning observational methods, as in ‘fieldwork,’ have objective and subjective dichotomies. I acknowledge these dichotomies, which are parallel with the crossing borders of the anthropology and the fine art discipline. Beginning with the aspect of the subjective I will keep with the intended focus of the blog as mentioned. I am personally from the current Western Culture and engage with objects from it. The objective of the project and the purpose of the use of material culture methods in my collecting process are to perceive how fundamental the interaction between a person and an object is to consistent consumption in the material world. Since I do not engage with all the objects from Western Culture, I am inquiring with others who have experience with objects that I am not that familiar with. 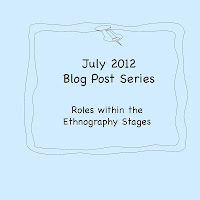 This aspect of the collecting process is where the different roles emerge with the stages of my ethnography process. The general progress of my ethnography stages within my research and practice are observation, first stage recordings of observations and experiences, and staged recording of the social interaction. The observation and first stage recording are overlapped with note taking, research experience with the object, and understanding the details of the experience from the social interaction. When I am observing my own interaction, I am in the dual role of the participant of the ethnography process as well as the ethnographer. Referring to Sarah Pink’s proposal of rethinking participant observation of a multisensory experience, she states, “Thus the notion of ethnography as a participatory practice is framed with ideas of learning as embodied, emplaced, sensorial, and empathetic, rather than occurring simply through a mix of participation and observation.” In my dual role I am focused on the bodies interaction with the object without an environment. The roles of participant and ethnographer are integrated because of my experience with an object and through the ethnography, revealing of knowledge concerning the sensory experience and the stages of the interaction. The dual role experience offers a reflexive process developing ethnographic knowledge for the second role. 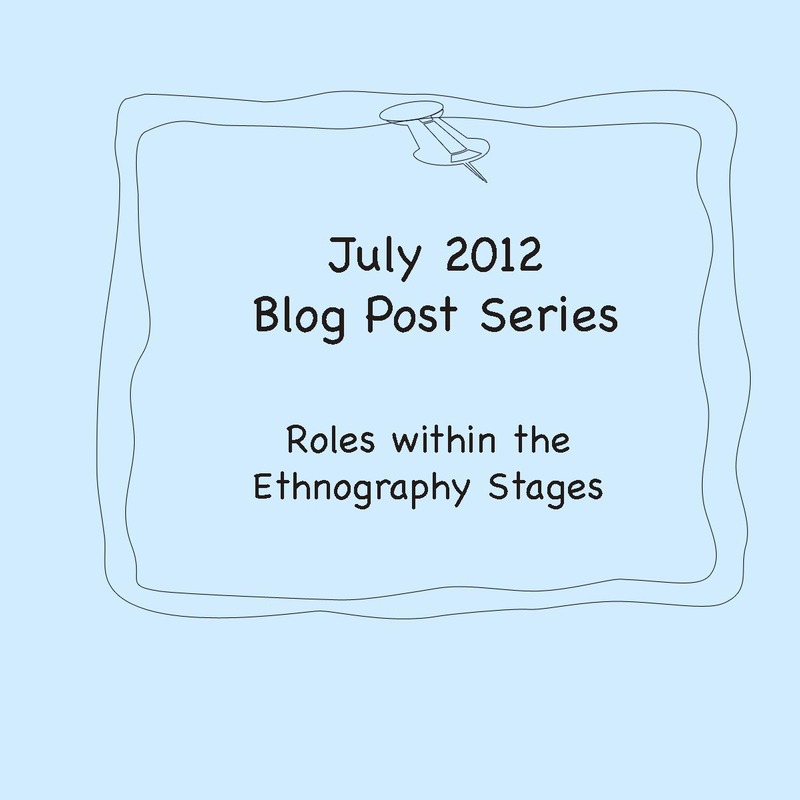 The second role is the ethnographer. This role occurs singularly when I am observing a participant other than myself performing the social interaction with an object. Observing, note taking, and interviewing are the methods employed before the staged recording of the social interaction with the participant. A current example of employing the role of ethnographer with a participant is demonstrated in a July 2012 recent addition video clip to the Mouth Collection. The observation was of a gentleman smoking his tobacco pipe. I have no experience with a pipe except that I can visually identify the object. My experience with the reflexive process pertaining to ethnographic knowledge contributes to my interviews and observations to stay focused on the participant’s body and the object. These questions refer to the sensory experience and the bodily movements of the social interaction. The participant’s verbal description and physically displaying the movements brings an understanding to the documentation of the staged recording. For example the pipe smoker described his movements with his pipe in hand as being slow and in short lengths away from his mouth. This understanding of movement of body and object established the framing of the clip to have a close up representation for the restaging process. The roles in the staged recording process range from videographer, performer, and curator. Currently, the one role that changes within this process is the performer aspect. I am the performer when I am the participant/ ethnographer of the ethnography process. The consideration for the presentation of the documentation (video clip) of the performers role persuaded me to restage the recording process. To restage a social interaction implies enabling me the ability to tightly frame the video clip and remove the environment. This approach brings a visual focus to the verbal and written description from the first stage of recording of the observations. I am not acknowledging these roles as pseudo characters to contribute to my creative process, but as ‘working’ roles within my art practice to develop knowledge and exposure to multiple perspectives. To view the clip and the July 2012 Recent Additions of the Mouth Collection please visit the website.